New Delhi, Oct 17: The Calcutta High Court today stayed the Centre’s decision to pull out troops for trouble-hit Darjeeling in West Bengal. Hearing a plea by the West Bengal government seeking a stay on Home Ministry ‘s decision to pull out Central forces from the hilly district, the high court asked the Centre to file an affidavit by October 23. The state government has been directed to submit its reply in the court by October 26. The court said that the troops would stay in Darjeeling till October 27, the date of next hearing in the matter. The home ministry had ordered withdrawal of as many as 1,000 paramilitary personnel, including 300 women, deployed in Darjeeling to maintain law and order during the agitation for a separate Gorkhaland state. In a communication, the ministry said seven companies of the Central Reserve Police Force (CRPF), including three women companies, and three companies of Sashastra Seema Bal (SSB) personnel would be withdrawn from Darjeeling from Monday. The Mamata Banerjee government had last month formed a nine-member board of administrators, headed by Binay Tamang, instead of the Gorkhaland Territorial Administration (GTA) to look into the development works in Darjeeling and Kalimpong. 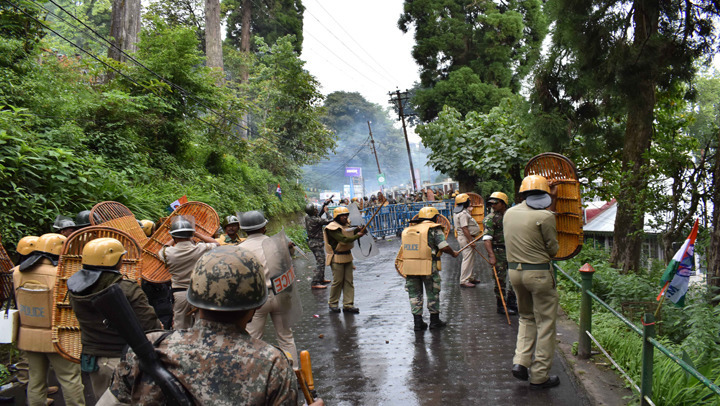 Normal life was affected for 104 days in Darjeeling and its neighbouring hills district Kalimpong after the Gorkha Janmukti Morcha (GJM) called an indefinite shutdown on June 12 to press for its demand for a separate state – Gorkhaland. The shutdown was lifted on September 27, hours after Union Home Minister Rajnath Singh appealed to the GJM to call off the over three-month-long strike and invited them for talks to find an amicable solution to the issue. Earlier this week, media reports claimed that fugitive GJM chief Bimal Gurung is planning to enter Darjeeling on or before October 30. Reports quoting intelligence sources said that Gurung may use human shield to enter Darjeeling to protect himself from being shot by the police. Gurung has been missing since August after the West Bengal government lodged cases against him under the Unlawful Activities (Prevention) Act. The GJM is an ally of the ruling BJP-led National Democratic Alliance. The Calcutta High Court today stayed the Centre’s decision to pull out troops for trouble-hit Darjeeling in West Bengal. Hearing a plea by the West Bengal government seeking a stay on Home Ministry ‘s decision to pull out Central forces from the hilly district, the high court asked the Centre to file an affidavit by October 23.